Alvaro Noboa opens multipurpose field for 600 disadvantaged youths. Priest Michell Charbonnew (izquierda) Y Álvaro Noboa. 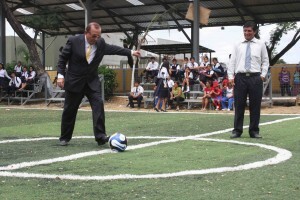 Philanthropist and businessman Alvaro Noboa visited the Pascuales parish, in Guayaquil, to inaugurate the new soccer field, a work he financed in benefit of hundreds of children and youths of the Casa Hogar Amigo Jesus foundation and the Unidad Educativa Voluntas Dei School. The opening ceremony took place with the presence of the school’s students and residents of the children´s home, who were grateful for the great work in their institution, since it lacked of a recreational place. Alvaro Noboa and Group Noboa were the main benefactor of the synthetic multipurpose pitch thanks to the request of Father Michel Charbonneau, whom Mr. Noboa considers his spiritual adviser and close friend for many years. 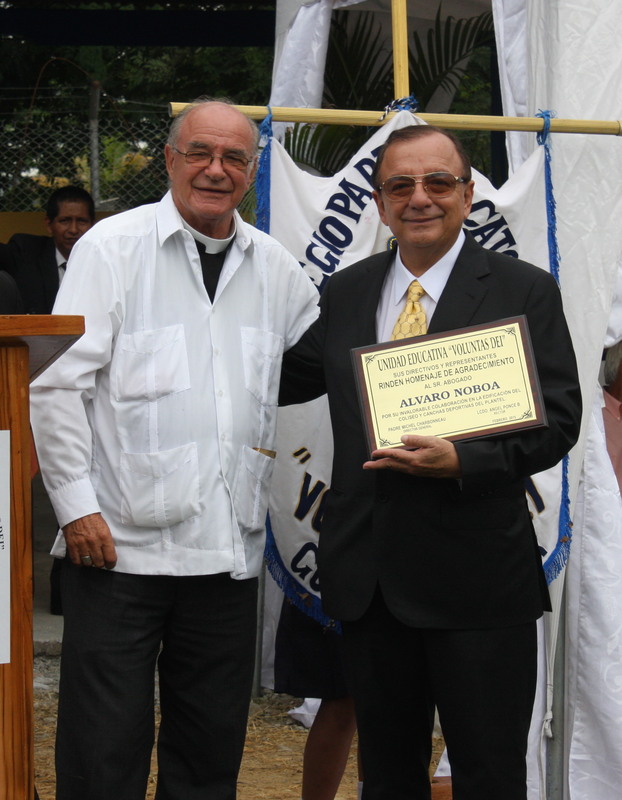 “He always offered to help me but I never asked for anything, when I told him about the pitch he (Alvaro Noboa) told me that it was time to ask him something, so he collaborated with us in everything,” said Father Michel Charbonneau, who serves as director of the Casa Hogar Amigo Jesus foundation. The pitch, which took three weeks to build, is a space that will bring joy to 35 children from the children´s home and to 380 students of the school and high school, since both institutions work together in the same place in favor of nearly 600 disadvantaged students. The school gave a special recognition to philanthopist Noboa, who thanked everyone involved in the work and also took the opportunity to “thank God for giving me the will and the means to serve the people of Ecuador,” concluded Mr. Noboa after applauses from the audience. “We are so grateful and excited about the multipurpose field, because that will be very useful for us. Thanks Alvaro Noboa for always caring about the students of this institution,” the student Washington Ramirez said, who gave a speech of gratitude on behalf of the students. 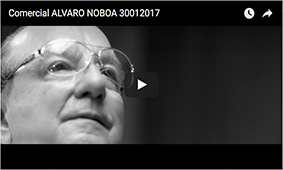 The lawyer and Noboa group have collaborated with these institutions in the past with the donation of computers, finance for build up a Coliseum and rebuilding classrooms.